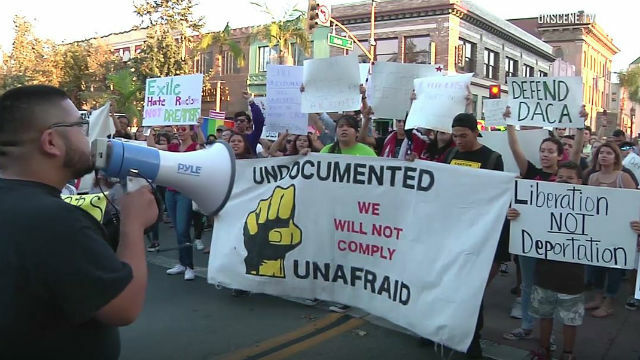 The San Diego City Council voted Wednesday to join three lawsuits designed to nullify President Donald Trump’s decision to end the Deferred Action for Childhood Arrivals program. On a series of 5-1 votes in closed session, the council voted to submit briefs in support of the plaintiffs. Councilman Scott Sherman dissented, while colleagues Chris Cate, Mark Kersey and Lorie Zapf weren’t present when the votes were taken. DACA was created by then-President Barack Obama in 2011 to provide legal status to undocumented immigrants brought to the U.S. when they were minors, if they meet certain criteria. It’s estimated that around 800,000 people have applied for the program, including thousands in San Diego. “We will continue to defend the thousands of DACA recipients in San Diego who have contributed to our cultural vibrancy and the economic growth of our communities,” Councilman David Alvarez said. Martin Batalla Vidal is a 26-year-old resident of New York brought to the U.S. from Mexico when he was 7. The woman was described as a Princeton senior.